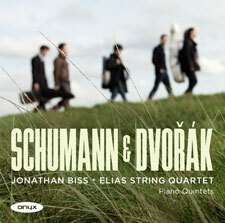 Jonathan Biss and the Elias Quartet play two of the greatest works for piano quintet. Dvoˇrák’s much-loved work was actually his second in this medium – another early work also in A major dates from 1872. This later work from 1887 has all of the mature Dvoˇrák’s hallmarks – lively tunes and sparkling rhythms abound. Schumann’s Piano Quintet is the most popular of his chamber works – spontaneous-sounding and captivating, it is a masterwork from his fevered period of composition in 1842.